(Phys.org)—Neutron stars, which form when massive stars collapse under their own enormous gravity, are some of the densest objects in the universe, second only to black holes. Yet while little is known about the interiors of black holes, scientists have a somewhat better understanding of what goes on inside neutron stars due to the fact that some of them emit radiation, often as X-rays. Using telescopes to detect this radiation, scientists know that the matter inside neutron stars is unlike anything found on Earth. Neutron stars are made almost entirely of neutrons, and are held together so tightly that their density is about the same as that of an atomic nucleus. But because of the gigantic size difference (about 10 km in diameter for a neutron star and 10-15 m for an atomic nucleus), the similarities end there. While a nucleus is held together by the strong force, a neutron star is held together by its powerful gravitational force. Under the enormous pressure exerted by this gravity, large numbers of neutrons can form giant stable nuclei—nuclei so large that they would quickly decay on Earth. While the largest of a neutron star's nuclei exist in its inner core, forming an exotic ultra-dense quark-gluon plasma, the star's less dense outer edges are composed of more conventional matter. Lying at the boundary between these two types of matter in this giant pressure cooker of a star is what scientists call "nuclear pasta." Nuclear pasta consists of very dense matter arranged in regular shapes, such as flat plates or rods, and is thought to be formed by the competition between attractive and repulsive forces of similar magnitude. The nuclear pasta shapes are made of not only neutrons, but some protons and electrons as well. Judging by the radiation emitted by the stars, nuclear pasta appears to exist in many complex phases, to which scientists have given names such as the gnocchi phase, the lasagna phase, and the penne phase—based, of course, on the predicted shapes. As humorous as the names are, these complex nuclear pasta phases could provide some of the most detailed information scientists may ever know about the strange characteristics of neutron stars. 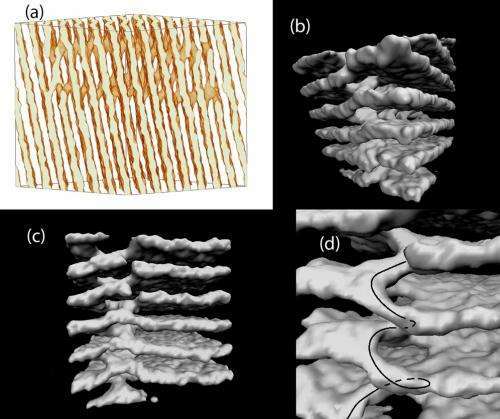 In a new paper published in Physical Review Letters, a team of physicists, C. J. Horowitz, et al., from Indiana University and McGill University, has explored the possibility that nuclear pasta could have irregular topological defects. "We have discovered possible defects that may exist in the otherwise regular nuclear pasta shapes, and these defects could decrease the electrical and thermal conductivity of neutron stars," Horowitz told Phys.org. A decrease in the thermal and electrical conductivities could, in turn, lower the temperature of the crust, cause the star's magnetic field to decay, and affect the star's rate of spinning. In their study, the physicists developed molecular dynamics simulations to explore how the topological defects form. Starting from a uniform random configuration of neutrons, protons, and electrons, the simulations showed that various helical (screw-like) defects form quickly and remain stable through the end of the simulation. The researchers then investigated how these defects can act as impurities to affect the magnetic fields of neutron stars, which are some of the strongest magnetic fields observed anywhere in the universe. Although neutron stars can spin extremely quickly (up to 700 times per second) in order to conserve angular momentum, the magnetic field normally exerts a torque on the star that slows its rate of spin in a process called "spin down." As neutron stars get older, they can spin down so much that it may take several seconds for each revolution. However, scientists have observed few isolated neutron stars with spin periods longer than 12 seconds, and aren't exactly sure why. One possible explanation is that, if nuclear pasta impurities decrease the star's thermal and electrical conductivities, then the greater resistance could lead to magnetic field decay. When the magnetic field decays, its torque also decreases, which could reduce the "spin down" process, so that the star maintains a minimum spinning rate. Based on their calculations of the effects of nuclear pasta, the physicists could predict light curves that indicate crust cooling (evidence of decreased conductivity) for one particular neutron star that has already been observed. They found that their predictions agree extremely well with observations made by the Chandra X-ray telescope, which has been orbiting Earth and observing space since 1999. The indirect effect of nuclear pasta on the spinning rates of neutron stars is just one way that the oddly shaped defects could play a role in making neutron stars what they are. The researchers hope to further investigate these defects in more detail in the future, with particular attention to the number, distribution, and kinds of defects, and the role they play in defining the ultra-dense matter and unusual properties of neutron stars. "We hope to learn how matter behaves when compressed to its densest form, just this side of collapsing into a black hole," Horowitz said. Neutron star magnetic fields: Not so turbulent? He may be referring to a many nucleus's revolving around necleus's; being stable only in that so strict of packed environment, any tighter, may be a BH; yet on earth so unstable one of this type of nuclei would not last for any time considering use of the word, 'long'. probably as long as new observances inside a collider last. billionth of a second. its the gravity at that amount of matter so crammed in so mine'ute a space it cant exist anywhere else. So center of this particular collapsed star, is a factory for this type nuclei. I wonder if there's any relation (being opposite in temp) to Boze-einstein condensate--that is formed when nobel prize winning scientists came the closest to absolute zero and discovered it. So strange, when light passes through it, light slows down.. Youtube: Absolute zero.. a history of, Cold.. The boze-einstein-condensate is like pasta also. This is really too much to handle. When will these guys ever stop. Gravity??? It is such a weak force that it is responsible for the formation of nothing. Electrical forces are 10 to the 39th times more powerful!!!!!!! Can any one spell the word PLASMA??? A hint should be the finding that the "neutron stars ....most powerful magnetic fields anywhere in the universe". What creates a magnetic field??? Electric current and only electric current. They would rather cling to an illogical theory that requires the breakdown of the laws of chemistry and physics for a mathematical creation that can't be observed or confirmed. Once the universe is viewed as an electrical body perhaps science can replace science fiction in cosmology and astrophysics. "—nuclei so large that they would quickly decay on Earth. That statement makes no sense on any level. Makes perfect sense, since on Earth (as the article explained) there isn't the type of gravity that can hold largish neutron assemblies together. They're not talking of the neutron star as a whole, here, but of one of it's large 'neutron atoms' which - despite being made up of many neutrons - is still microsocopically small. This is really too much to handle. . .
Are you going to explode or something? We can only hope. bbbbwindows: Maybe there are some currents inside a neutron star, going in circles and producing the magnetic field... What would the difference be? You want a dynamo model for a neutron star, have it your way. But don't assume electric arcs going through neutron stars and out the opposite way; those produce circular magnetic fields. "Multiple exclamation marks,' he went on, shaking his head, 'are a sure sign of a diseased mind.' "
I didn't realize we had discovered that gravity held atoms together. We're not talking conventional atoms, here. We're talking about many neutrons mashed together in the approximate density of atomic nuclei most elsewhere in the universe. Neutron assemblies are not inherently stable. They fly apart. To make them stable you need a counterforce. On a neutron star such a counterforce (gravity) is present to a sufficient degree. On Earth it is not.